Enjoyable Euro spy thriller that just twists enough to pull itself away from the edge of nonsense. Just. Liam Neeson gets in an identity tizzy running around Berlin in a blend of “Vertigo“, “Three Days of the Condor“, and “The Bourne Identity” and a dash of “The Parallax View” conspiracy spice. Neeson is Dr Martin Harris, a biochemist in Berlin with his wife to give a presentation, who then suffers a car crash, and is saved by Diane Kruger‘s taxi driver. Waking up in hospital a few days later, he tracks down his wife only to find her claiming not to know him. Worse, he has been replaced by fellow Irish thesp (well, half-Irish) Aidan Quinn who is now Neeson’s Dr Harris and husband to his wife, and has the passport and other ID paraphernalia to prove it. Shunned by all as a nutbar, he sets out to find the truth, hooking up again with a reluctant Kruger and avoiding numerous naughty men with guns and syringes and knives and bombs. By the numbers stuff, really, if you’ve seen any identity/conspiracy type thriller in the past. You know he’s been setup and the fun is just trying to figure it out. 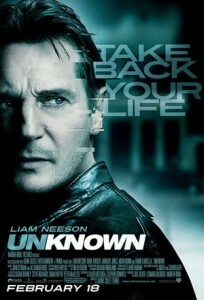 “Unknown” does a fair job of keeping you guessing, holding its reveal to quite late on in a disappointing piece of exposition with bad people falling into the James Bond trap of monologuing (thanks, “The Incredibles“) instead of just opening fire. That said, Berlin looks good and gritty on film, enhanced by a wintry location and generous aerial shots that pay credit to the city. There are also enough tense scenes and action set-pieces that are well handled, while a crafted sequence in a gallery is the sort of thing Brian De Palma used to do when aping Hitchcock. Lovely stuff. Its climax is also a charmer, doing some damage to a major Berlin landmark in a typically European way – just blasting some of it to pieces rather than the Hollywood option of obliterating everything for kilometers around. Neeson does a fair job in the second of his recent Euro-thrillers (following on from “Taken“) but he still displays a little too much of the cartoonish angst he displayed in “Darkman“, making it hard to buy his pain and suffering. A minor niggle in an otherwise solid movie. 1 Comment on "Unknown (2011)"